In keeping with the year-end tradition of making lists here at TAM, I have compiled a Top 20 Club Bangers of 2010! This list will consist of twenty electronic music songs that have made waves and shook the ground a bit this year. Being one of the biggest years ever for electronic music, with artists like Tiesto, Deadmau5, Armin, and Swedish House Mafia in the mainstream, and more underground artists like Afrojack, Laidback Luke, Ducksauce, and Nero, slowly getting recognition for their groundbreaking tracks released this year, more and more people are appreciating electronic music for what it is. Breaking Billboard’s Top 25 Tours of 2010, at number 25 was Tiesto grossing just over $28.6 million. Another huge accomplishment was Deadmau5 being the resident DJ at The MTV VMA’s. Several artists on the list also had their tracks featured as Record of the Week on BBC R1 . 2010 as brought on the development of a newer (since about 2000) form of electronic called Dubstep into the mainstream. Popularized in London, UK and slowly making its way over to the U.S., Dubstep has been described as, “tightly coiled productions with overwhelming bass lines and reverberant drum patterns, clipped samples, and occasional vocals.” Some people find it annoying, but surprisingly, a lot of people really enjoy it, so look out for the few Dub Step songs that make the cut on this list. 20. “I Will Be Here” (Laidback Luke Remix) – Tiesto & Sneaky Sound System: This song just makes the cut since it was remixed by Laidback Luke in 2010, even though it was released originally on Tiesto’s Kaleidoscope (2009). 19. “Not Giving Up On Love” – Armin Van Buuren vs. Sophie Ellis Bextor: Off the album Mirage, Armin never seems to disappoint. This being the second single off the album which reached number 5 on the US Dance/ Electronic Charts, I am happy to say this song made the top 20. 17. “Some Chords” (LightsoverLA Dubstep Remix) – Deadmau5: As you will soon find out, Deadmau5 has quickly become my favorite artist of 2010, and when I fist hear this Lightsover remix, I nearly pissed myself. The things that are being done with sound never cease to amaze me. 16. “Illmerica” (Extended Mix) – Wolfgang Gartner: An American electro house artist/producer, has blown away the competition this year and really solidified his position among the greats. His songs have also held the number 1 spot on the Beatport Top 10 Chart throughout 2010. 15. “The Island” (Tiesto Remix) – Pendulum: In a year dominated by UK based artists, Pendulum (formerly of Perth Australia), has really risen to the top as an electro rock/ drum and bass group. The original version peaked at 41 on the UK singles chart. The Tiesto remix gives me chills everytime. The fourteen through eleven and actually number fifteen as well would all be, under normal circumstances, in the Top 10, but like I said, this year has been massive for all aspects of the Electronic Music Genre, and with that being the case, there have simply been a ton of top notch songs released. So just keep in mind that just because they aren’t in the Top 10, doesn’t take anything away from them! 14. “The Time (The Dirty Bit) (Afrojack Remix)” – The Black Eyed Peas: Seems like they’ll never let you down for a solid dance track and most times a completely solid dance album. 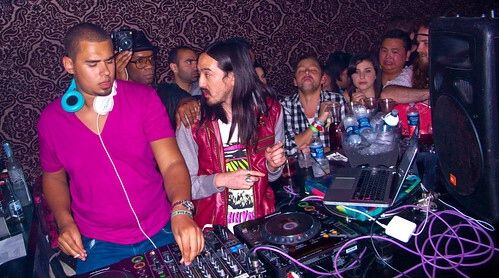 But the real hero here is Afrojack, the Dutch dj and producer who has collaborated with the likes of David Guetta, Lady Gaga, and Laidback Luke. Here he makes an awesome song well awesome-er. 13. “Hello (Dada Life Remix)” – Martin Solveig & Dragonette: This song, in its original version is just a springy, poppy, dance song, but Dada Life, the Swedish electro-house duo, just makes it like wall of sound epic. One of my faves. 12. “Me & You” – Nero: Another massive Dubstep track that will certainly go down as a classic for the genre. Made up of two dudes and a chick who sings and hailing from the UK, Nero used to be the prime suspect for some bangin Drum & Bass, but have come in and torn up the Dubstep scene. They are also currently contenders for the BBC Sound of 2011 Title. 11. “Louder Than Words” – David Guetta & Afrojack: Like I said all of these songs are awesome, there are just sooooo many that I need to put them somewhere. With that said, again, Afrojack has done it again, this time with the Frenchmen, David Guetta, who believe it or not is 43 years old. Guetta has actually been in the game since 1984, and being that 2010 has been the year of Electro House, he has flourished. This song is another powerful anthem that backs up his sweep at the World Music Awards taking home 3 of 3 including Best DJ and Best Producer, as well as his Grammy win for Best Remix (When Love Takes Over) and nomination for Record of the Year for his collaboration with The B.E.P.’s on “I Got a Feeling”. Check out the Official Video for Nero’s “Me & You” below. Britney Goes British: Her Latest Single Kicks It Dub Step Style!